Well, today's the day that the film, the one they said couldn't be made, the one that changed forever the future and existence of character animation, "The Little Mermaid", is released on DVD in a special-special 2 disc edition. Just exactly what's on this I'm not yet sure; I was privy to only about 30 minutes of watching some pieces of the various supplements this afternoon--someone else's copy. I haven't even purchased mine yet. 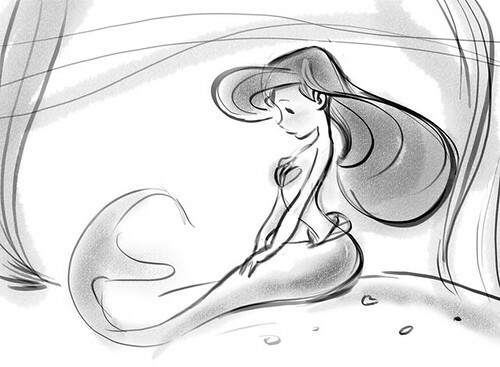 What I wanted to see was the pencil test version of "Part of Your World" that Glen Keane brought to Calarts one evening and showed us. I've never had a pencil test make such an impression on me before or since(the music being as beautiful as it was didn't hurt, either.) But I think it's not included on this release...well, there's loads of other goodies, including many scenes in story reel form. If you read this blog you really have got to have this. "Mermaid" was released in 1989, an age ago. "Roger Rabbit" had already come out and made the impact it did--and whatever you think of that film's merits, it certainly had an inarguable, important effect on animation being taken seriously as crossover adult entertainment. That was a distinction lost on the mainstream media as well as the public almost since the beginnings of television, when all "cartoons" became unfortunately ghettoized as being for kids only. This film had everything going for it; that old expression about the stars being in perfect alignment certainly seems true in its case. Clever ideas, a sincere story and real, breathing characters...and a talented staff of artists dying to sink their teeth into drawing and animating it all. And the composing team--a perfect fit and application of the abilities of musical-comedy pros with humor, great lyrics and story sense. I watched a story reel version of "Poor Unfortunate Souls"--I'd forgotten just how witty the lyrics are, and what a great performance Pat Carroll gave singing it...not to mention the animation! And the editing, and the color styling...yes, it's great. I can't recall the film having any dead spots...nothing that made me say, "oh, yeah, well, once I get past this scene..."
I'm gushing, sure. But I wonder how many people under thirtysomething really remember what a bombshell hit this was in '89? I saw it several times, once at the Cinerama Dome, of all places(this must have been pre-El Capitan retrofitting); the showing was a 10pm one(that in itself a first, as most animated features didn't have shows past 6pm), the crowd was packed(this more than a week after opening--maybe two weeks). The audience that laughed, clapped and sat in rapt attention was mostly 18-40...for an animated cartoon about a "little" mermaid. Now that's a sensation. For all the subsequent wincing at the inappropriate and overdone musical comedies in animation, all the ripoffs and merchandising and cynicism in some quarters, we really owe our jobs, all of us, to the tremendous success of that one film which jump-started the business. "Animation" signified something that got the average person in the street excited and intrigued, without embarrassment. Our audience is different now, times are different, but the essential desire of the audience to be surprised and entertained is still the same. "Mermaid" was a hit because it was just so, so good--and such a surprise. The elements that worked then are certainly still within the grasp of today's filmmakers. It's more than possible. As good as the animation was, the key to Mermaid was the music. When it was made, movie musicals were utterly dead. They were movies where the story was interupted for an often irrelevant musical interlude. Mermaid was more like an opera, where the music carried the story and was near continuous. Menkin and Ashman should be given a huge chunk of credit for the success of LM, and for the success of the follow on Disney musical animated features which formed the second Disney golden age. I enjoyed LM, but I thought the climax lacked an idea on the level of the rest of the movie. It was a stepping stone to the pinicle which was BB and LK. I totally remember this movie - it was the one that opened me up to the wonderful world of animation and is the reason I'm sitting at sheridan today....thanks for the little retrospective! On a side note, a really funny and depressing thing happened. I'd been waiting for this movie since April, finally went to get it yesterday from Best Buy, and lo and behold, I start to watch it later that night (obviously after the store's closed) and there are TWO disc ONES! bizarre no? Couldn't have happened to someone else haha. Great article, Jenny. I also remember sitting in the theater on opening night, just thinking "Wow." It was the movie I'd been waiting for Disney to make since I was a little kid. Be advised - the transfer on the new DVD has some significant encoding issues, and the soundtrack is heavily (and IMHO, badly) doctored ("enhanced"). The original mix is not included. Somebody at Disney Home Video has a lot to answer for. The extras are great, though, and are fortunately worth the purchase price just by themselves. I credit Roger Rabbit and Little Mermaid (and borrowing a paperback version of "Art of Illusion" from a guy in college) for getting the fire in me belly burning for animation. I've always loved the art form ever since I was a little one, but it was those two films that really honed it in for me. I'm looking forward to buying the DVD set (and enjoying it with my daughter)! I loved this post about Mermaid. My roommates and I bought it last Tuesday and have watched the "Part of Your World" sequence almost daily since! It's amazing. I wish the rough version was included. There's like 2 seconds of it in the documentary and its such a tease!